The word camera is derived from the Latin name camera obscura, or dark room, describing the natural optical phenomenon that occurs when an image of a scene is projected through a small hole and appears as a reversed and inverted image on a screen or wall . The Han Chinese philosopher Mozi provides us with the oldest known record of this principle of light approximately 400 years B.C.E. He correctly asserted that the image formed from the projecting hole is inverted because light travels in straight lines . All cameras are derived from this natural phenomenon, and this process is similar to how our eyes capture light and project images on our retinas for our brains to interpret. Royce Hall Camera Obscura. The word camera is derived from the Latin name camera obscure, or dark room, describing the natural optical phenomenon that occurs when an image of a scene is projected through a small hole and appears as a reversed and inverted image on a screen or wall. Image Credit: “UCLA ~ Royce Hall” by Prayitno is licensed under CC BY 2.0 , image compiled by Kristina Garske. It wasn’t until clever chemistry was combined with the physics of light that human beings were able to fix images created by the camera obscura. Joseph Nicephone Niepce made the earliest recorded photograph in 1826 (Photograph) . Using a wooden box camera, he exposed a pewter plate coated with bitumen to light for 8 hours . Bitumen, or asphalt, is a viscous mixture of hydrocarbons that is obtained as a natural byproduct from petroleum distillation, which is commonly used today for road surfacing and roofing. The bitumen would harden on the pewter when exposed to light. Niepce would then wash the pewter with solvents so that only the hardest materials would remain on the pewter, leaving behind the first positive print image . 1. An optical element composed of lenses that focus the image. 2. A chemical or digital component that senses and records light. 3. The mechanical structure of the camera that controls the amount of light that enters the device and the time of light exposure to capture an image. Timeline of advancements in camera technology. Image Credits: 1. “View from the Window at Le Gras" by Joseph Nicéphore Niépce is licensed under CC0 1.0 Universal (CC0 1.0) Public Domain Dedication. 2. “1884 Michigan Wolverines football team." by 1884 Michigan football team photograph is in the Public Domain. 3. “4th of July in Paris, France, 1918 (7466415374)” by USMC Archives is licensed under CC BY 2.0. 4. “A montage of notable events in the 1930s.” by User:CatJar is licensed under CC BY 2.0. 5. “Camera Communication” by Pixabay is licensed under CC0 1.0 Universal (CC0 1.0) Public Domain Dedication . Image Compiled by Kristina Garske. Lenses form an image by refracting light. As light scatters from the subject being photographed, it passes through the air and into the lens of the camera. Today, lenses are made of many different materials, including glass and plastics, and are molded, polished or ground into task-specific shapes . All cameras use converging lenses that focus light on a single point to form an image. 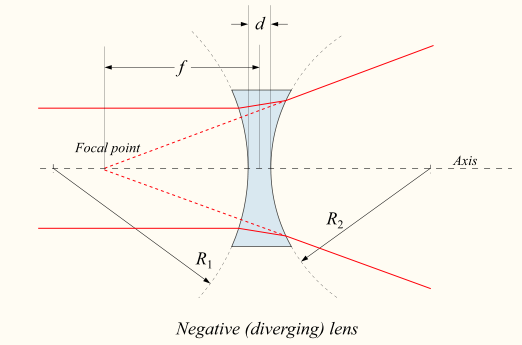 Lenses can focus scattered, or diverging, light by a process called refraction. Refraction occurs when light travels through mediums of different densities, causing light to change speed and bend. The light diverging from the subject of the image passes through the less dense air and hits the denser material of the lens, bending the light towards the normal (or inwards) (Figure showing the normal). This is similar to a car driving at an angle towards a patch of grass. As the right tire hits the border of the grass first, the left tire is still on the pavement. Since the left tire is moving faster than the right tire, it causes the cart to swing right as it moves forward into the grass. Lenses refract light at specific angles. When light hits a lens, it does so at a particular angle, known as the angle of incidence. As the light passes into the denser lens, it creates a sharper inward angle. The light then passes through the lens and hits the air on the other side. Since air is less dense than the material of the lens, the light speeds up as it exits the lens and leaves at an obtuse outward angle (or away from the normal). Imagine our car exiting the grass patch, but this time the left tire hits the pavement first, making it travel faster than the right tire, which causes the cart to swing right. When we think of subjects to be imaged, the closer that subject is to the lens, the sharper the angle of incidence, and the further the subject from the lens, the more obtuse. Light from a closer subject converges, or focuses, farther away from the lens than light beams from a subject further away. Since most light sensors or films are fixed in a camera, it is necessary to adjust the lens position to focus the light on the light sensors. 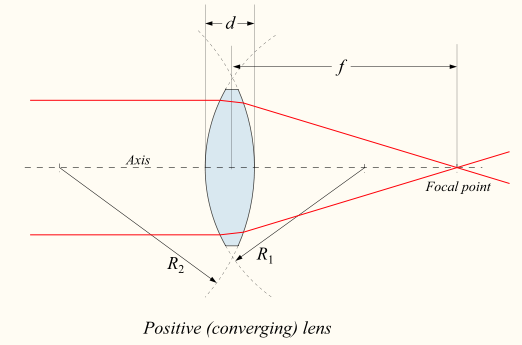 How much the light bends is determined by the structure of the lens. Round shaped lenses, known as convex lenses, bend light towards the normal, converging light. Lenses also come in other shapes such as concave, which bend inwards and diverge light, or planar lenses. Rounder shaped lenses increase the distances between the points light hits when it incidences with the lens. This curvature causes the light to form sharper (or acuter) angles. Thinking of our car example again, when the right tire hits a grass patch that bends away from the left tire, the left tire has to travel further to meet the grass patch, forcing the car to bend further inwards when traveling into the patch. The benefit of this effect is that light focuses at a closer point, forming a shorter focal length. Flatter shaped lenses form more obtuse angles, causing the light to converge farther away, increasing the focal length. An increased focal length does, however, have another advantage best exemplified by a magnifying glass. The longer focal length allows light beams to spread apart farther, magnifying the image. Therefore, the magnification power of a lens is described by its focal length. This effect is the reason a photographer might choose a telephoto lens with a long focal length to magnify an image of a distant mountain range, while a wide-angle lens with a short focal length, is better suited to shrink a close-up portrait image. A wide-angle lens with a short focal length is better suited to shrink a close-up portrait image such as the picture above depicting the south station is Boston. Image Credit: “South Station, Boston [275/366]” by Tim Sackton is licensed under CC BY 2.0. Lenses are tasked with collecting the light diverging off the subject being photographed. It is the responsibility of the light sensor to capture the image. Traditional SLR 35mm cameras use film to capture the image using cleverly engineered chemistry. Visible light is part of the electromagnetic spectrum and is a type of energy. Light carries energy in the form of energy packages called photons. These photons excite grains of silver-halide crystals in the film causing a chemical reaction due to a process known as photochemistry. The result of this chemical reaction is the formation of a stable-latent-image site on the film that can be processed to produce a photograph. More common light sensors for digital cameras are a charged-couple device (CCD) and complementary metal-oxide semiconductor (CMOS) . These are semiconductors that convert photons into electrons. Accumulating electrons create a charge proportional to the light exposure time. This charge is then amplified to a voltage signal, quantified and converted into an image. The difference between CCDs and CMOSs is how they read the converted electrons and create a value that is translated into an image, called the digital value . The shutter stop controls the length of time the sensor is exposed to the light. It is essential to control the amount of light exposed to the light sensor. To prevent too much light from being exposed for too long, cameras are built with an aperture stop and shutter control. The aperture stop controls the amount of light passing through the lens. It does this via an iris diaphragm that is made of a series of overlapping metal plates that can fold in on each other or expand out. Ideally, the exposure time should be set to the minimum to freeze the motion and avoid image blurring - unless, of course, you aim to set a long-exposure image like taking a photograph of star-trails. Cameras have become an extension of our eyes, capturing our environments in intricate detail. From capturing intimate details of family members to recording a detailed visual record of history and war, the camera is one of the most influential inventions of the modern era. Continued technological advances and the availability of cell-phone cameras have democratized photography and inspired artistic expression as well as powered revolution. 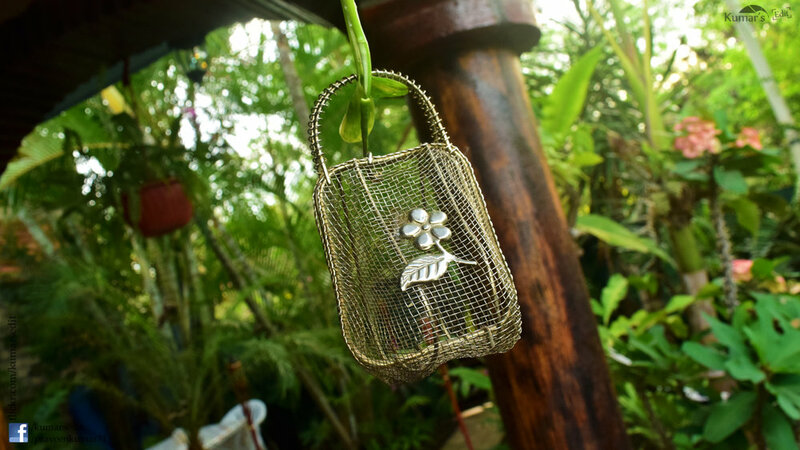 Today, we can see different perspectives all captured by a simple click of a button. Imaging Beyond the Pinhole Camera. (Springer, 2006). Meschede, D. Optics, light, and lasers: the practical approach to modern aspects of photonics and laser physics. (Wiley-VCH, 2017).